We are a small group of friends, trying out an experiment. We’re interested in using conversation as a practice for cultivating presence, awareness, and connection. We’re not talking about ordinary conversation (i.e. the trading of personal stories in order to find common ground), but a special kind of conversation that could be called “groundless” — where the conversation itself matters more than its content. 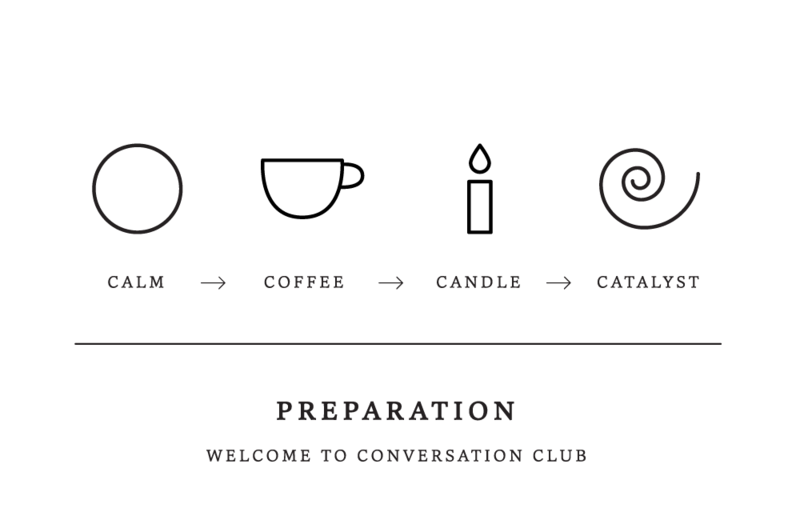 Conversation Club is a framework for going beyond habitual modes of relating, in order to experience a deeper kind of connection. It is not a debate club, so no outcome is needed. Nor is it a therapy group, a confessional, or an intellectual salon. If anything, it is a kind of communion — an oasis where people can drink from the source. We’ve identified a few simple guidelines that seem to invite this special kind of experience. 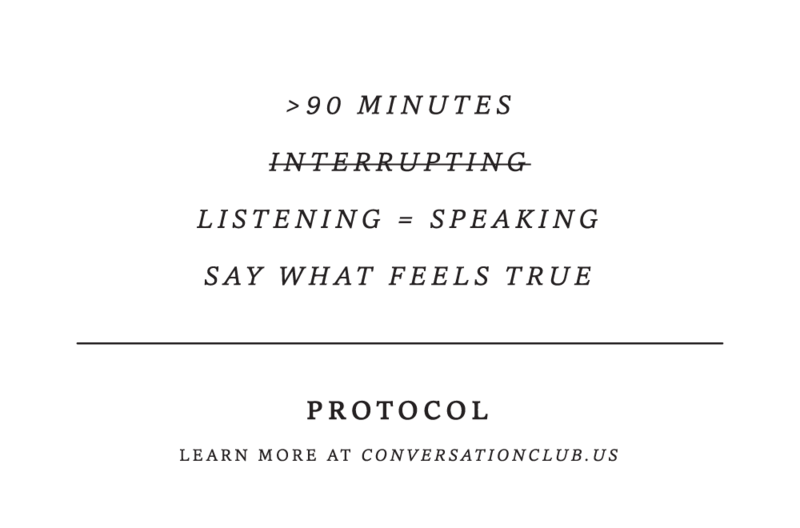 The first set of guidelines (Preparation) have to do with creating the context; the second set of guidelines (Protocol) have to do with the conversation itself. Calm — Find a calm and quiet place, free of distractions, ideally without other people around. Put your phones away, and turn off the music. Coffee — Provide coffee or tea, or some other refreshing drink. You may also want to provide a few simple snacks, such as nuts and pretzels. Candle — Light a candle to signal the start of the practice. Extinguish the candle to signal the end. If you have access to a fireplace, wood stove, or campfire, that can also be helpful, though not essential. Catalyst — Begin the conversation with a “catalyst,” prepared by one of the participants. This can be a reading, a personal reflection, a piece of music, or any other provocative offering. A good catalyst is something the catalyzer does not completely understand — some growing edge of mystery into which he or she has been pressing. From there, the conversation is free to go in any direction. >90 minutes — Continue the practice for at least 90 minutes. After 90 minutes, the group can decide whether to stop or keep going. In our experience, after 120 minutes, it usually feels like the right time to conclude. Interrupting — When someone is speaking, no interrupting is allowed. If someone rambles on for too long, you may raise your hand to protest. When you speak, speak from silence. This guideline also has a secondary meaning: no interrupting yourself. Listening = Speaking — Listening is just as important as speaking. It would be totally valid to attend a whole Conversation Club and not say a word. Listening is the other side of speaking; one depends on the other. Say What Feels True — When you speak, say what feels true in that moment, without relying on familiar anecdotes and arguments. When someone else is speaking, don’t preplan your response. Your words should come as a surprise, even to you. We hope you enjoy the practice — please tell us about your experience.